I purchased Home Inventory from the Mac App Store and it keeps asking me for a serial number. What do I do? The Mac App Store version of Home Inventory does not require a serial number. However, the Mac App Store will not install over a version of the application that was installed outside of the Mac App Store, such as the trial version. In order to install the Mac App Store version of Home Inventory, you will need to remove Home Inventory from your Applications folder. Home Inventory is not for me. How can I get a refund? If you purchased directly through our website (meaning not from the Mac App Store or as part of a third party promotion or bundle deal), head over to the main support page and contact us. If you purchased Home Inventory as part of a bundle deal or a third party promotion, you will need to contact the promotor as we cannot issue refunds on their behalf. Select Contact Support on the left. Select “contact us” in the Account and Billing Support section. From the list of options, select “The topic is not listed. Enter a topic in the box that appears and then click Enter. Now click the Continue button that appears. FINALLY…. you will be taken to a page where you can click a button that says Email to send them a message and request your refund. Are there any differences between the Mac App Store version of Home Inventory and the Binary Formations Website version? With the exception of the Maps feature, which for technical reasons is only available in Mac App Store version, the features for Home Inventory are the same whether you purchased the app from the Mac App Store, our website, or a third party. Purchasing through the Mac App Store offers you convenience in managing all your apps from one place. For instance, the Mac App Store version does not require a license key. If you switch to another computer in the future, you simply download all of your purchased apps from the Mac App Store. You don’t have to go to each individual site and download the product and no need to keep up with license keys. You also have the opportunity to rate and review apps in the Mac App Store. At this time, we have no plans to end support for purchases made outside the Mac App Store. Can I upgrade from the version I purchased from your website to the Mac App Store version? Apple currently does not provide a way for developers to upgrade users of a non-Mac App Store version of their software to the Mac App Store version without purchasing the software again on the Mac App Store. If there was a way to do this, we would take advantage of it. Unfortunately, it is not possible at this point. Is there a manual for Home inventory? Yep. Just select Home Inventory User’s Guide from the Help menu in Home Inventory to bring up the manual. Creating new categories is easy. Simply click the popup that says Locations at the top of the list on the left side of the window. Select Categories from the list to browse your inventory by category instead of location. Click the + button beneath the list to add a new category. Can I use Home Inventory with Dropbox? Yes. You can store your inventory file and your inventory backup file on Dropbox. First make sure to have the Dropbox client installed on your computer. To store and access an existing inventory file on Dropbox either copy your existing inventory file to your Dropbox folder via Finder and open this in Home Inventory or do a Save As in Home Inventory to save the file in your Dropbox folder. To create a new inventory file on Dropbox select your Dropbox folder when prompted for the location of your inventory file. Click here for a video on storing your Home Inventory file on Dropbox. Caution: Home Inventory is not designed for multiple machines accessing the same inventory so if you decide to store you inventory file on Dropbox you should never have the file opened by more than one computer at a time or file corruption is likely. We highly recommend using Dropbox with Home Inventory for backup purposes. You can configure the Local Backup/Backup Now feature in the Home Inventory Preferences to backup to your Dropbox folder. See the Backing Up Your Inventory chapter in the manual for more details. Be sure to select the Dropbox Root directory for your Backup if you would like to sync it to Home Inventory Mobile Backup. Does Home Inventory support iCloud sync? Not yet. We have been experimenting internally with syncing through iCloud and other options for a long time. Home Inventory is different than to-do lists, recipe apps, and other apps that typically take advantage of free sync services in that the data can get quite large and the data model itself has some very complex interrelationships that greatly complicate syncing. We are currently experimenting with Apple’s new CloudKit framework as the underlying mechanism for syncing data in Home Inventory. It has been a challenge, but encouraging at the same time. It is still too early to say whether or not it will be the solution we go with as there are many factors involved. In the meantime, Home Inventory can backup your inventory to Dropbox and Home Inventory Mobile Backup can pull down those backups and let you view them on your iPhone or iPad. Can I store my inventory file on iCloud Drive? Yes, on the Mac. You can store your inventory file and your inventory backup file on your iCloud Drive folder if you are running OS X 10.10, Yosemite or later. Click here to find out more about iCloud Drive from Apple. To store and access an existing inventory file on iCloud Drive either copy your existing inventory file to your iCloud Drive folder via Finder and open this in Home Inventory or do a Save As in Home Inventory to save the file in your iCloud Drive folder. To create a new inventory file on iCloud Drive select your iCloud Drive folder when prompted for the location of your inventory file. Caution: Home Inventory is not designed for multiple machines accessing the same inventory so if you decide to store you inventory file on iCloud Drive you should never have the file opened by more than one computer at a time or file corruption is likely. Can I store my inventory file on a NAS or network share? We do not recommend this. Home Inventory uses SQLite as its underlying database. SQLite makes use of certain low-level file operations for better performance. While some NAS (Network Attached Storage) and SAN (Storage Area Network) devices and other network share implementations may be compatible with this, most are not. For this reason, we cannot vouch for Home Inventory operating reliably with an inventory file on a NAS, SAN, or network share. How do I configure and create a back up of my inventory file? Select Preferences from the Home Inventory menu. Select the “Backup to a local folder on your Mac’s hard drive” option. Select the “Change Backup Folder” button and select the folder on your Mac’s hard drive or connected external drive where you would like to keep your inventory backup files. If you want Home Inventory to automatically backup your inventory file each time the file is closed, check the “Backup my inventory file before closing or quitting” option. 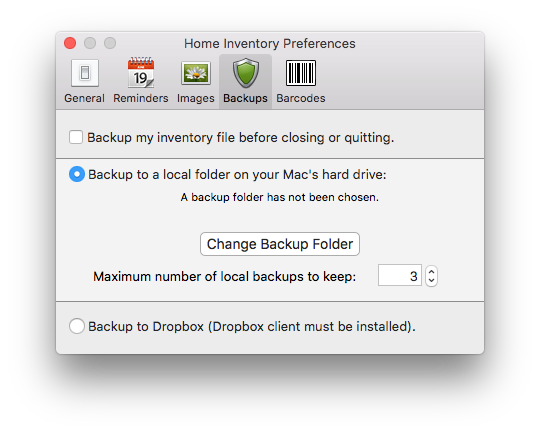 The “Maximum number of local backups to keep” setting tells Home Inventory how many previously backed up versions of your inventory it should keep. The default is 3. If you have the Dropbox client installed, you can select “Backup to Dropbox” instead. You will be prompted to select the Dropbox folder. If you plan to use the Dropbox integration with Home Inventory Mobile Backup make sure to select the root folder which by default is Dropbox. Whether or not you enable automatic backups, you can create a backup of your inventory at any time by selecting the “Backup Now” option from the File menu. When Home Inventory creates a tiered local backup of an inventory file, it uses the name of the original inventory file, but places a ~ at the front and ~ followed by a number at the end. The number indicates the ‘age’ of the backup, where the smaller the number, the newer the backup. In this example using the default file name My Inventory, there are three backups. ~My Inventory~1 is the newest backup that was made, whereas ~My Inventory~3 is the oldest backup that was made. If the ‘Backup to Dropbox‘ option is selected in the Backup Preferences, the backup file name will be the same name as your original file. How do I restore a backup of my inventory file. Navigate to the folder where your local backups are stored. Double-click on the backup file icon. Home Inventory will recognize the inventory file as a backup and suggest that you save a copy to a new location. Give the inventory file you are restoring a name that does not include the ~ characters. 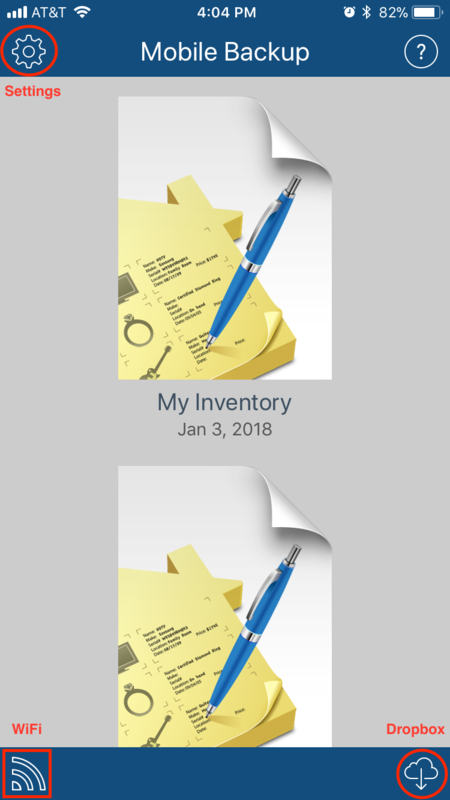 Navigate to Binary Formations/Home Inventory/Mobile Backup in your Dropbox folder and copy the inventory over to where you want it on your Mac’s hard drive. Double-click the copied inventory to open it in Home Inventory. In Home Inventory your Mac, select the Home Inventory Mobile Backup option from the File menu. In Mobile Backup on your Mobile device, tap the WiFi button in the lower, left corner of the main screen. Tap the name of your Mac when it appears in the list of found devices in Mobile Backup. On your Mac, select the Restore tab and select the inventory file you wish to restore from the list. You will be asked to choose a location on your Mac to restore the file. Select the location and then click the Create button. Why does the maps feature only work with the Mac App Store version? Support for Maps was introduced in Home Inventory 3.1. It requires that you run OS X 10.9 (Mavericks) or later and is only available in the Mac App Store version of Home Inventory. In order for a sandboxed application to make use of the framework provided by OS X that we use to implement this feature, the application must be granted a special entitlement by Apple. That entitlement is only granted to Mac App Store applications. I keep getting a 'Failed to retrieve security sandbox bookmark' message. What does this mean? The message you are seeing is related to the sandbox security system in OS X. Apps that run in the sandbox, like Home Inventory, need your permission to access folders outside of the sandbox. In some cases, such as accessing the backup folder, Home Inventory stores what is called a bookmark that it hands to the OS to get previously granted permission. It’s likely the backups feature was turned on at one point and either the backup folder was moved or deleted or something changed within the OS such as an upgrade that invalidated Home Inventory’s permission to that folder. Go to Preferences under the Home Inventory menu, then click Backups at the top of the preferences window. Either un-check the backup option or click Change Backup Folder and select the folder you wish to backup to and you should be okay from then on. Does Home Inventory encrypt my data if I set a password for my inventory file? No. The password protection in Home Inventory is designed to keep out nosy people and common thieves, not computer savvy criminals. We weighed the pros and cons of encrypting the database and thought the performance hit and other technical hurdles outweighed the added security. Encryption is something we periodically reevaluate so it may be something we support in the future. I forgot my password. Can you help me open my inventory file? Nope. As stated in the manual, we cannot reset your password if you forget it. We strongly recommend you make use of the password hint feature to help you remember your password in case you forget it. Can I still use Home Inventory Photo Remote with Home Inventory? Photo Remote does not work with Home Inventory version 3.3 and later. It has been replaced by Home Inventory Remote Entry. You can still download Home Inventory Photo Remote from the App Store if you need to use it with an older version of Home Inventory. What versions of Home Inventory support the Remote Entry helper app? You need Home Inventory version 3.3 or later on your Mac to use Remote Entry. Remote Entry replaces the Home Inventory Photo Remote app, which can only be used with Home Inventory versions prior to 3.3. Can I add items using Remote Entry without being connected over WiFi? Yes. Unlike the Home Inventory Photo Remote app, which Remote Entry replaces, Home Inventory Remote Entry has an Offline Mode that lets you add items without being connected to Home Inventory on your Mac. Remote Entry will give you the option to add any items created offline to Home Inventory on your Mac the next time you connect to it over WiFi. Can I see the custom fields, field layouts, locations, tags, etc. from my inventory in Offline Mode? Sure can. When Remote Entry connects to an inventory over WiFi, it remembers the categories, collections, conditions, locations, tags, custom fields, and field layouts from that inventory so they are available the next time you use Offline Mode. For efficiency reasons, Remote Entry does not pull down all of the item data, so you will not see the items already in your inventory when working offline. Why can I only add items using barcode scanning through Remote Entry when it is connected to Home Inventory over WiFi? While the scanning takes place in Remote Entry, the actual barcode lookups are performed by Home Inventory on the Mac because the agreement we signed with our primary data source has restrictions with what we can do on a mobile device. We are exploring other options that will (hopefully) allow us to add barcode lookup support in Offline Mode. What does the barcode symbol that appears on the right side above the keyboard when adding or editing an item do? Tap this button to scan the data from a 1D or 2D barcode into the selected field. This is a quick way to add serial numbers and model numbers for items that have barcodes with that information. The barcode types supported by this feature are: UPC-E, Code 39, Code 39 Mod 43, EAN-13, EAN-8, Code 93, Code 128, PDF 417, QR Code, Aztec, Interleaved 2 of 5 (iOS 8 only), ITF 14 (iOS 8 only), and Data Matrix (iOS 8 only). While we would like to offer an Android version, it is not something we have the resources to do at this time. We are a small company and have to budget our resources carefully. Our current plans are to devote most of those resources towards future versions of the Home Inventory on the Mac, with the remaining time going to the iOS helper apps and other projects. When I try to connect over WiFi, my inventory shows up but nothing happens when I tap on it. Under the Apple menu on your Mac, click System Preferences. In the System Preferences window, click Security (in some versions of OS X this is called Security & Privacy). Click the Firewall tab to see if a firewall is turned on. If the firewall is turned off, then you do not have a problem with your Mac’s built-in firewall. If the firewall is turned on, click the Advanced button (you may need to click the lock in the bottom left of System Preferences window and enter your password in order to make changes to the firewall settings). If Home Inventory appears in the list of applications, select its connection privilege to the right and set it to Allow Incoming Connections. If Home Inventory does not appear in the list, click the + button to add it and make sure it is set to Allow Incoming Connections. Click the Ok button after you have made your changes. I cannot connect to Home Inventory and my inventory doesn't appear in the list. If you are having trouble connecting to Home Inventory with the Remote Entry app, you need to first make sure that both your Mac and iPhone are on the same network. Next, make sure you select Remote Entry from the Inventory menu in Home Inventory on the Mac to broadcast its availability to receive incoming connections from Remote Entry. If you are still unable to connect, try restarting your iPhone, iPad, or iPod Touch. Sometimes things can get a little glitchy with WiFi and a restart often helps. Head over to this page for instructions on restarting your iDevice. You will also want to make sure that support for Universal Plug and Play (UPnP) is enabled on your router. Home Inventory makes use of the Bonjour protocol to broadcast its availability and this requires UPnP. If you have any third party security software (including a firewall enabled on your router), you will want to make sure it is not preventing the broadcast from Home Inventory. My computer shows up in the list, but Mobile Backup does not connect to it over WiFi when I tap on it. My computer does not show up in the list when I try to connect to Home Inventory over WiFi. If you are having trouble connecting to Home Inventory with the Mobile Backup app, you need to first make sure that both your Mac and your iPhone are on the same network. Next, make sure you select Mobile Backup from the File menu in Home Inventory on the Mac to broadcast its availability to receive incoming connections from the Mobile Backup. My inventory file does not download when I select download from Dropbox. Home Inventory Mobile Backup looks for your inventory file in a sub-folder created by Home Inventory in the root Dropbox folder. The first time the backup is created by Home Inventory it will create the sub-folders Binary Formations/Home Inventory/Mobile Backup. Check to make sure the Home Inventory Backup Preference ‘Backup to Dropbox’ is on and that the Root Dropbox folder (typically named Dropbox) is selected. If any other folder is selected other than the Root folder, Home Inventory Mobile Backup will not find your inventory file. How do I back up my inventory file to Home Inventory Mobile Backup? Make sure you have Dropbox installed on your Mac. You can signup for Dropbox and download the installer by clicking here. 2. Select Preferences from the Home Inventory menu. 3. Select the Backups tab in the Home Inventory Preferences window. 4. Select the “Backup to Dropbox” option. 5. Home Inventory will then ask you to select your Dropbox folder on your hard drive to given it permission to create backups there. It is important that you select the Dropbox folder itself (by default it be in your home folder) and not a folder inside of the Dropbox folder as Home Inventory will create a specific directory in your Dropbox folder where Mobile Backup will look to find your inventory backups. You can enable automatic backups just like you do for onsite backups if you wish or use the Backup Now menu option to create a backup manually. 1. Launch Home Inventory Mobile Backup (you can download it from the App Store if it you do not already have it installed). 3. Turn on the “Download Dropbox backups” option. 4. Sign into your Dropbox account. 5. You can also enable the “Auto-check for new backups” option to automatically download new backups from Dropbox whenever Mobile Backup is launched. 6. Enable the “Download only when on WiFi” if you only want Mobile Backup to download inventory file backups when your mobile device is on a WiFi network and not when it is only on a cellular network. You can also manually download backups from Dropbox to Mobile Backup by tapping the download button in the lower, right corner on the main screen. 1) In Home Inventory your Mac, select the Home Inventory Mobile Backup option from the File menu. 2) In Mobile Backup on your Mobile device, tap the WiFi button in the lower, left corner of the main screen. 3) Tap the name of your Mac when it appears in the list of found devices in Mobile Backup. 4) On your Mac, select the inventory file you wish to backup (it must be open in Home Inventor) from the Backup tab and click the Backup button. Dropbox: If you selected to backup your inventory files to Dropbox in the Home Inventory Backup Preferences, tap the Download from Dropbox Button to download backups from your Dropbox account. Make sure to enable the Download Dropbox backups in Mobile Backup’s settings. You can also automatically download your Dropbox backups for Home Inventory by enabling the Auto-check for new backups. If you are concerned about data usage, turn on the Download only when on WiFi setting. WiFi: Tap the Backup/Restore Over WiFi button to connect directly to Home Inventory on your Mac over your WiFi network. In Home Inventory on your Mac, select Mobile Backup from the File menu to open the connection window and follow the instructions. How do I restore my inventory file from Home Inventory Mobile Backup?